Horus, the falcon-headed god, is one of the most well-known figures in ancient Egyptian mythology and was held in such high esteem that one of the best-preserved temples in Egypt, located in a town called Edfu, is dedicated to him to this day. 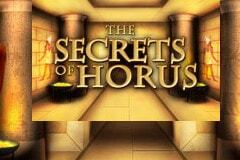 In the Secrets of Horus video slot, you are set to find yourself paying a visit to the impressive tomb where the illustrious god was buried as you attempt to decrypt the hieroglyphics etched onto the walls to unlock the secrets as to where all his valuable treasures can be found. A dramatic yet mystical soundtrack accompanies your explorations in Horus’s tomb as you find yourself surrounded by mesmerising walls that are laden with hieroglyphics and witness an array of iconic ancient Egyptian themed items appearing on parchment reels. There are 5 reels with 3 rows and 20 adjustable win lines with tomb fees of 40p up to a maximum of £40 available with all lines active thanks to the coin sizes varying from 2p, 5p, 10p, 20p or 50p and up to 80 coins allowed to be staked each spin. While these fees will keep low limit players happy, the high roller punters amongst you will probably be disappointed and try other casino slot machines instead which is understandable. Just because the stakes are low doesn’t mean that it’s not worth your while exploring Horus’s tomb as locating the god will see you rewarded with up to 10,000 coins and finding Scarab Beetles will see you scoop up to 500x you stake before getting to spin the reels for free! You won’t be surprised to learn that Horus leads the way in this free Secrets of Horus slot machine as the highest-paying symbol on this papyrus styled pay table as he is the Wild symbol. Not only does this mean that he has the power to substitute for all other symbols except for the Scatter (Scarab Beetles), finding Horus will see you rewarded with up to 10,000 coins and when he does substitute for winning combinations they will double in value. The eye of Horus stands for protection, royal power and good health and whenever you see it appear on these reels you will be rewarded with powerful wins of up to 750 coins. You will also be rewarded for locating a golden ring with hieroglyphics etched onto it and a sarcophagus with rewards of up to 500 coins on offer for locating each, the falcon and scrolls will see you claim up to 250 coins, an eagle is worth up to 200 coins, lions see you claim up to 150 coins, the green reeds, yellow chick and hieroglyphic see you win up to 125 coins, while the outstretched hand sees you scoop up to 100 coins. If you read any writings on ancient Egypt you will be aware that the Scarab Beetle symbolised the restoration of life, however on these reels they signal big Scatter wins and the triggering of free spins. While two Scarab Beetles appearing anywhere on the reels see you claim 2x your stake, it’s three or more of them you’ll need to trigger free spins. This feat sees you claim 15 free spins with three of them earning you a Scatter win worth 5x your stake, four of them on the reels at once earning you 25x your stake and the rare sight of five of them on the reels at once sees you granted an incredible win worth 500x your stake. Just when you thought things couldn’t get any better, all wins are tripled in value to make your trip to ancient Egypt one to remember! It’s not one of NetEnt’s latest releases hence the old styled interface and despite being mobile-optimised, boasting great sound effects which immerse you in the theme and offering the potential for decent sized wins, I prefer others that NetEnt have released such as Egyptian Heroes and Pyramid: Quest for Immortality as they both boast far superior graphics and even greater prizes!